A Bitcoin Fork? No... It's Bitcoin FourK! Feel free to use and share my charts, but please mention me as the author. 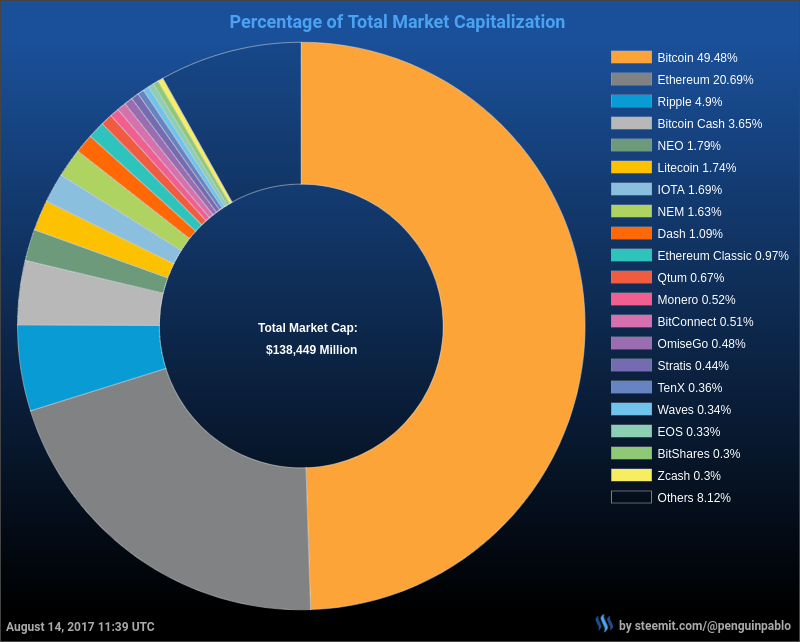 NEO, coined as the “Chinese Ethereum,” has taken over the #5 position, edging out Litecoin, NEM and IOTA. Taking a look at the 24-hours volume below, we can see NEO has also traded the most over the past 24-hours besides Bitcoin and Ethereum, who usually win. In the wake of record-setting growth for digital currencies like Bitcoin and Ethereum, graphics card manufacturer Nvidia has expressed their intent to focus more on the cryptocurrency mining market. If you ask anyone in the Bitcoin space what the biggest challenge for Bitcoin is, you will likely hear the answer “scalability”. The Hong Kong-based bitcoin trading platform has announced it is immediately leaving retail market in the United States because of challenging regulatory environment. Bitcoin has nearly passed the market cap of PayPal for the first time, the latest statistics from the industry confirm. In what Colu’s Udi Wertheimer called the “real Flippening,” Bitcoin’s market cap at press time was almost $68 bln, compared to PayPal’s $70 bln. Bitcoin made an unplanned appearance at the most recent DOTA (Defense of the Ancients) International Tournament, as an audience member held up a ‘Buy Bitcoin’ sign during announcements of the televised event. Nvidia's CEO is bullish on cryptocurrencies following Q2 sales figures that were boosted by GPU sales to miners. As Indian authorities ponder a regulatory framework for the future of digital currencies in the country, India’s foremost financial official has remarked about the growing popularity and adoption of bitcoin. 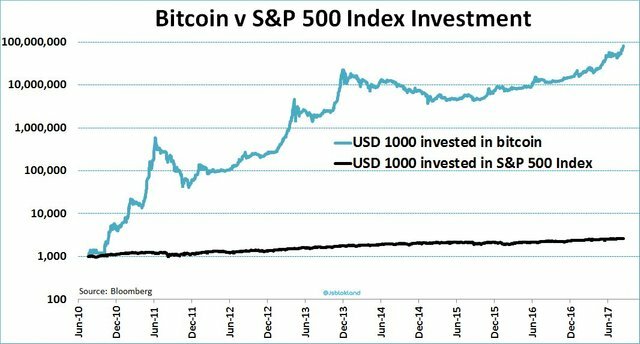 $1000 USD invested in Bitcoin in July 2010 would now be worth $80 million! Buying SBD might not be a bad idea. If the witnesses decide to raise the interest rate it should trend back towards $1. I'm completely off topic, but the bottom section of steemnow is not working today and I am lost without it! I use the wonderful filter there on "latest posts" to find many things throughout the days - now that section is blank and I am lost lost lost! Sometimes the steemd server is a bit slow. I have no problems at this moment with the 'latest posts' section. Does it work correctly again on your side too? I voted for the 3-4 witnesses who advocate the interest rate increase. I got this advice over the weekend and added my voice to hope they will do it. I am not too knowledgeable about this, but I saw the advice a few times, so decided to add my minnow voice to the effort. Yes, i think too that steem is currently undervalued. But it's a good idea to buy SBD at this time. And i think that's the witnesses should review the interest rate to 5% to encourage steemians to save SBD and bring it back towards $1. Dropping to 23rd place has my interest . We were in 15 in June when I signed on . I hope undervalued is the only problem . thanks for share nice information @penguinpablo ..
How about the future imagination of STEEM? Steemit....goes back to that old saying . Just a ponzi scheme that benefits the ones in the top. Probably a good call to buy Steem against BTC. I did this yesterday as well, should have waited i guess. but in any case i see steem making a jump of 20% a hell of a lot easier than BTC atm. The rewards are allocated so that 75% of the payout goes to the author of the post/comment, and 25% goes to the curator. Of the 25% that goes to the curator, that portion will be split between the author and the curator if the curator votes within the first 30 minutes. The split of the 25% between the author and curator during the first 30 minutes is calculated linearly based on the time the vote is cast. • If a post is upvoted the moment of posting, 100% of the curation reward goes to the author. • At 3 minutes, 90% goes to the author and 10% to the curator. • At 15 minutes, it's a 50/50 split. • At 27 minutes, 10% goes to the author and 90% to the curator. • If a post is upvoted 30 min after posting, 100% of the curation reward goes to the curator. I'm a mannequin and I still have to learn a lot! At this rate BTC will hit 30k before DOW does!! I award you a doff of the cap for the title good sir. Well done.